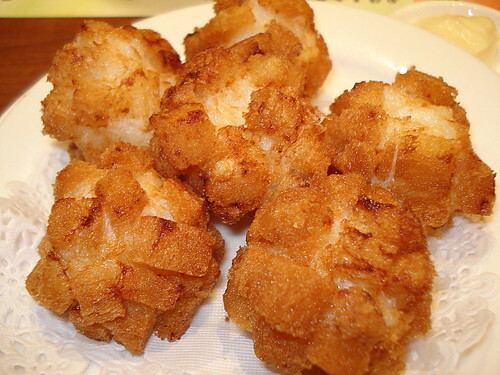 Breadcrumbed Sotong Balls, originally uploaded by Camemberu. I haven't stepped into Crystal Jade for the longest time. The menus and even the paper placemats have changed (full colour now!). We actually didn't really have a good experience the last time here at the Bishan Junction 8 branch but just wanted some Chinese, and so acquiesced to come here. Pretty cosy atmosphere though, in a dark, maze-like labyrinth with intimate lighting. While waiting for our food to arrive, a waitress came and offered us these breadcrumbed, or rather crouton-coated sotong (squid balls. These were not on the regular menu, only available occasionally, she said. We were hungry and they looked good. Tasty yes, even if a bit greasy. However, if I had known they cost S$6, I'd have thought twice about getting them. 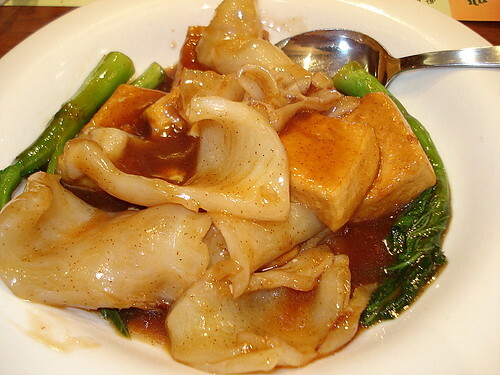 Braised Tofu with Fish Maw, originally uploaded by Camemberu. They also had these "double dish deals" for S$20+ for combos of some new dishes. I was craving some fish maw, so opted for Combo C - which had this braised tofu with fish maw. I wish I could embed here a sound effect for the error buzzer you see on gameshows. Wrong kind of fish maw. Yuck, I hate these. I like the puffy, fried, spongy type, not these. But well, at least baby girl liked the tofu - she (the fussy eater) polished off at least four of those slices. 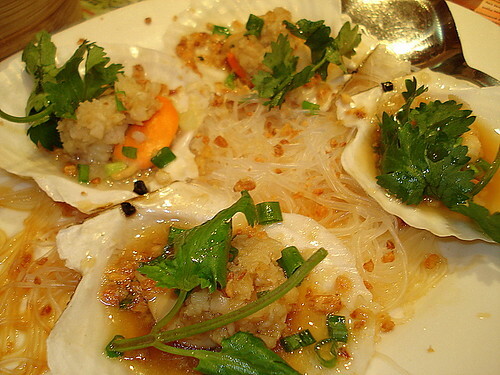 Scallops and Garlic with Vermicelli, originally uploaded by Camemberu. The other dish in the combo deal was scallops and garlic with vermicelli. It really looked much better in the menu photo. What came to us looked sloppy. Worse - the scallops were overcooked. Hubby didn't like the fishyness either. We should have gone for Combo A (butter and cereal prawns; sweet-and-sour pork with peach). But baby liked the garlic-laced vermicelli - good girl! Like Anthony Bourdain, I don't understand people who don't like garlic (strangely, they exist - my mother-in-law for example). We had some dim sum too. 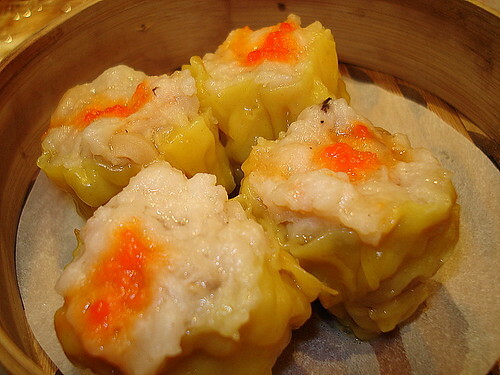 Siew mai is hubby's favourite (I generally prefer har gow - shrimp dumplings). I trust they were good since they were gone in a jiffy. Didn't get to taste any of this as was too busy feeding the little one mashed tofu. 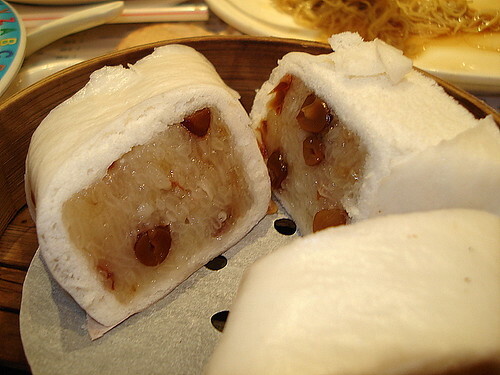 Teochew Glutinous Rice Dumpling Roll, originally uploaded by Camemberu. Can't remember the exact name for this but yeah they turned out quite different (I was expecting something more akin to chee cheong fun - rice rolls). Were too full to eat this, so doggy-bagged them home. Quite plain, oddly both sweet and savoury. Purely a carbo boost. 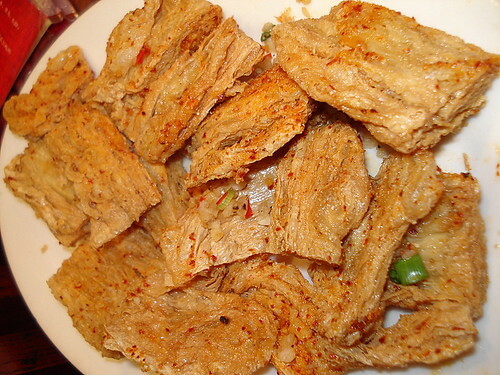 Deep-fried Beancurd Skin with Salt and Pepper, originally uploaded by Camemberu. Now this dish would make a great beer snack...crispy and highly seasoned. However, it might be an MSG bomb cos I had terrible headaches after this (and I'm an MSG aficionado!). Hubby wisely stayed away after one bite (and so did not have said headaches). He likened them to the McDonald's shaker fries. It's also too large a platter - they should serve in smaller portions for cheaper. Sorry, pic shows the dish reconstituted after some wastage and garnishing out of place - baby girl tried to grab some and upset the plate. 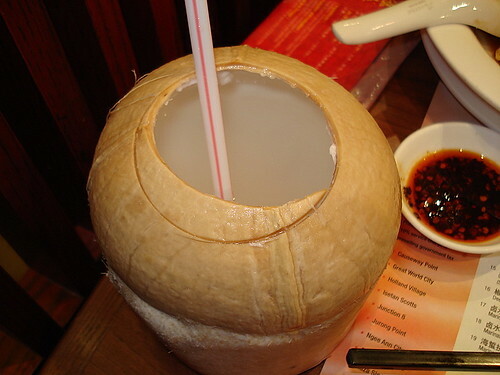 Extremely refreshing Thai coconut, originally uploaded by Camemberu. Now this was a surprising new item - very good Thai coconut! Not sure if these are also the ones they inject sugar into, but they sure tasted incredible. Cold and refreshing. Hubby had two in the end! So, as usual, hits and misses with this restaurant chain. Although considered inexpensive, the bill can stack up after a while. Hi, wanna ask if this is a good place to go solely for dim sum? Or the Crystal Jade at taka is better? Helldiver, dim sum at the Crystal Jade chain branches are normally fairly safe. I didn't really think the one at Taka was much more outstanding (then again have only been there once, what with the reservations hassle and all). If you just want really good dim sum, there are probably other Cantonese restaurants that do a better job (e.g Wah Lok at Carlton, Cherry Garden at Oriental, Hua Ting at Orchard Hotel - just my 2 cents).